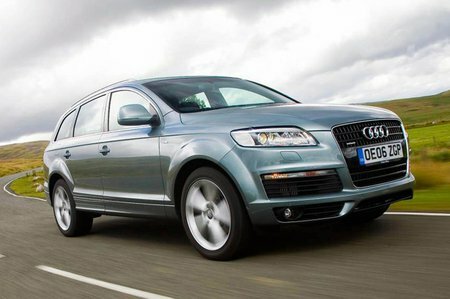 What's the used Audi Q7 4x4 like? The Audi Q7 was the company's first attempt at a full-size 4x4. It combines a desirable badge on the front with seven seats and solid build quality, and can tackle a muddy field and ferry the family around without breaking a sweat. It's a huge car, though, being over five metres long and nearly two metres wide, despite which it's not as large inside as you might expect. On top of that, it's singularly short of style, an important element at this price level and among its premium competitors. The Q7 is better-suited to on-road driving, but the air suspension system can raise and lower the ride height as required for any off-road antics. At lower speeds the ride can be unsettled, but this disappears on faster roads. It's also surprisingly agile for such a large vehicle, with decent four-wheel drive grip through corners and good body control. The Q7 is refined and although wind and road noise can be heard, it doesn't distract. The interior has reasonable space in the first two rows of seats, although not as much as you might expect for such a large car, but the third row is best reserved for children. Boot space is acceptable, but it can be enlarged by folding down the rearmost seats into the boot floor when they're not needed. So the Q7 is a bit of a mixed bag. The second-generation version is actually one of our favourite cars, but this first one is harder to recommend. 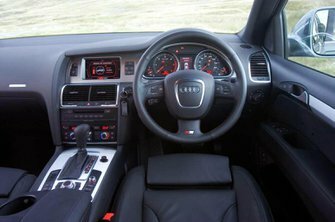 However, if you're in the market for a prestige badge on a large car that can carry seven people, at a pinch, and you can afford to pay for the fuel and servicing costs, then a used Q7 might make a lot of sense.